significantly greater risk for the development of diabetes. research providing early evidence that body fat storage patterns (assessed by simple methods such as WHR) were a key predictor of metabolic abnormalities and health risks. overweight, with over 475 million obese adults. obesity has further increased since the IASO/IOTF report was published just a few short years ago. In fact, the WHO reports that, in 2014, over 1.9 BILLION folks across the world are overweight, with over 600 million of those folks being classified as obese. That’s over a 25% increase in obesity in less than 5 years. every 3 adults in the United States are overweight or obese, and over one-third of the adult population is obese. body fatness, fat storage patterns, and levels of lean body mass. Typically, an “ideal” or “normal” weight is calculated as a ratio of body weight to height. limitations associated with the BMI and using this avenue to assess health and fitness. store an excessive amount of fat in their mid-sections were more than twice as likely to die from cardiovascular disease compared to “obese” people whose body fat was more equally distributed throughout their bodies. to lean mass) is arguably the most accurate means to discern health status, using waist circumference and waist-hip ratios may be alternative options. complications. With that said, according to the World Health Organization (WHO), women with a waist circumference greater than 31.5 inches and men with a waist circumference greater than 37 inches are at an “increased” risk for metabolic complications. “substantially increased” health risk because of their fat distribution. your control, that can be addressed to prevent the accumulation of and/or reduce the amount of existing visceral fat. is also very effective at improving carbohydrate tolerance and insulin sensitivity. (i.e., 5 – 6 days of 45 – 60 minutes of exercise) is associated with significant weight loss. have identified a similar association between cortisol concentrations, coping skills, chronic stress, and excess belly fat. There are a number of potential explanations for the stress-cortisol-belly fat connection. lipogenesis, which is the process of fat synthesis and storage. cortisol is essential for adaptation, homeostasis, and survival. For instance, cortisol (which belongs to the glucocorticoid family of hormones) has a profound effect on blood sugar regulation, as its role is to liberate glucose when blood sugar levels are low. body weight, energy levels, and wellbeing. The impact of stress on eating behaviors and diet quality is a profound one, and stress has been associated with higher caloric intake, increased saturated fat and sugar consumption, and poor diet quality. “Emotional eating” is defined as eating to relieve negative emotions (e.g., unhappiness, anxiety, or anger), and stress has been well documented as a key negative emotion involved in emotional eating. Emotional eaters typically consume more calories, they eat more frequently, and they indulge in greater amounts of highly palatable, high￾calorie, sweet, high-fat foods in response to emotional stress. It’s no secret that stress can be a “trigger” for overeating. In fact, research shows that around 70% of individuals increase their food intake during periods of stress. Females, overweight individuals, and folks who think about food or body weight obsessively are more likely to eat when stressed. a predisposition for high-sugar and high-fat foods, which are “comfort foods” known to provide strong rewarding effects and reinforce snacking. promote repeated attempts to boost mood through stress eating patterns. leads to overeating and weight gain. overall stress levels (i.e., allostatic load). to lower both stress and cortisol levels. contribute to healthy stress levels. nervous system activity (i.e., rest and digest), and lower cortisol levels. stress. Another adaptogenic herb, Ashwagandha has been shown to have a dramatic cortisol lowering effect. Brings whole new meaning to the phrase, “Take a chill pill,” doesn’t it? diet) result in even more significant reductions in visceral fat than either individually. carbohydrates (e.g., sugar-sweetened beverages) may selectively promote the storage of belly fat. fats with more monounsaturated fats (i.e., Mediterranean diet) prevents visceral belly fat gain despite consuming an equal number of calories. Additionally, adherence to the Mediterranean diet has been shown to be associated with lower waist circumference values independent of body weight in both men and women. reduced-calorie diets may be more effective at reducing visceral fat. be used along with an overall healthy diet, regular physical activity, and routine stress management strategies to help fight visceral belly fat. which boost mood and ease anxiety and stress. were challenged with a mental task. 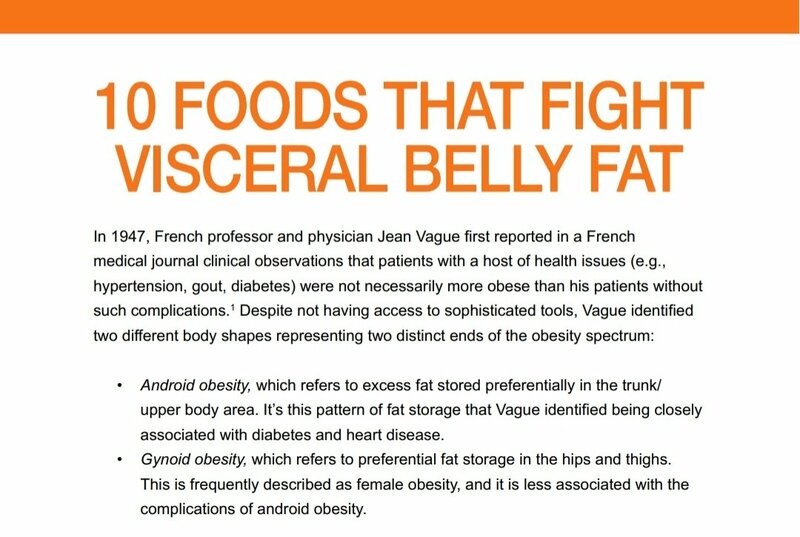 indicators of visceral fat and abdominal obesity. experienced significantly less belly fat accumulation compared to without. fatty acids (by 0.3 – 3.0 grams per day) can reduce body fat, particularly abdominal fat, in overweight and obese folks. associated with reduced visceral belly fat as a result of a decrease in the size of fat cells. weight loss and reductions in waist circumference (i.e., visceral fat) compared to diet alone (without the addition of omega-3 fats). additional effect in reducing waist circumference, a measure of abdominal obesity, in combination with a weight-loss program. participants) showed that supplementation with omega-3 fats significantly reduces waist￾to-hip ratio both as standalone treatment and when combined with a weight-loss program. modification intervention” (e.g., diet and exercise). composition as well as physically active folks. • Accelerate fat loss and spare lean body mass while following a reduced-calorie diet. • Attenuate weight regain and contribute to long-term weight maintenance. • Increase satiety and improve appetite control. • Improve carbohydrate metabolism and glycemic regulation. circumference among a large group (over 40,000) of people over the course of 5 years. They found that, besides fruit and vegetable intake, only protein intake (specifically, animal protein) was inversely associated with belly fat. meat and eggs) are at the top of the list. whenever possible. In a recent systematic review and meta-analysis published in the British Journal of Nutrition, a group of researchers critically analyzed data from 67 different studies comparing the composition of organic (i.e., grass-fed, pasture-raised) and non￾organic (i.e., conventional) meat products. They found that meat from pasture-raised animals contained 47% more omega-3 fatty acids than conventional meat products. Further, several studies have examined the nutritional content of eggs from pasture raised hens compared to eggs from commercial caged chickens. In a study conducted by researchers in Penn State’s College of Agricultural Sciences, eggs from pasture raised hens were shown to have 2 ½ times more omega-3 fats and less than half the ratio of omega-6 to omega-3 fats. counterintuitive—is that recent research has shown that a high intake of dairy fat (e.g., full-fat milk and yogurt) is associated with less belly fat. significantly higher than conventional milk in omega-3 fats, by an estimated 56% more, organic milk contained an estimated 41% more conjugated linoleic acid (CLA). CLA has been shown to improve body composition (i.e., reduce body fat, increase lean body mass), enhance immunity, and promote a healthy inflammatory response. Even more, there is also some evidence that CLA may reduce visceral belly fat.